When I tell you that this is an easy craft I mean e-z! And what's best is that it's a personalized signature that family members and friends will really like! Take your fingerprint or your child's using either the first finger or thumb and press onto the ink pad then press finger onto label. If using brown paint just paint finger and then stamp onto label. 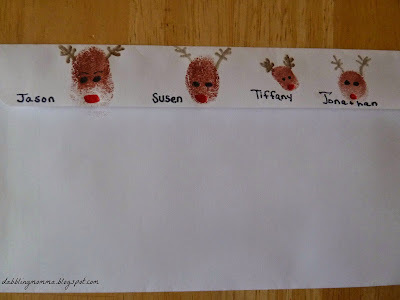 Once that's done simply decorate by using the black marker for the eyes and mouth (if giving your reindeer a smiley face), red marker for the nose and brown marker for the antlers. And so, so easy and fun to do! I'm going to hand out some gifts with fingerprint labels this year. Thanks for this idea. This will be great for the grandparents gifts. Oh Grandparents would love this Natasha! To see their little ones fingerprints! So cute..need to do these for Christmas with my kids. Thanks, Alecia! This is such a fun and easy craft to do with your kids! Oh I love these Susen! So cute, I'm pinning. If you're free next Tuesday, I'd love for you to share on our Facebook page, this is adorable. Thanks, Heather! I plan on being by on Tuesday!! Darling!! So simple and cute. The little ones will love it! 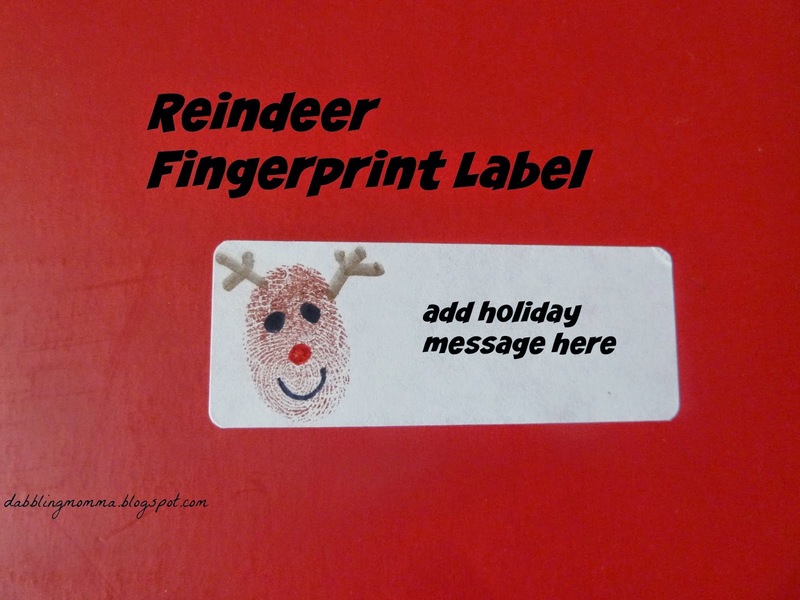 Yes Elizabeth the kids love how their fingerprint turns into a cute little reindeer! It also puts a smile on the face of the recipient! Thanks for stopping by! Such a cute idea! Definitely using this for my Christmas cards. Thanks Laura, glad you like it! It's a nice personal touch. Thanks for the comment! Adorable! I'll definitely try to do these with the little one...if I can get her to sit still longer than two seconds, that is! Otherwise, I'll just have to make 'em with only my own prints! Hi Brandyn! I literally grabbed my daughters finger while she was having lunch, lol! Just gave the finger a quick wipe off and we were done and she was back to her lunch...it's seriously that simple! I hope you have fun with it! Thanks so much AmieJo! I appreciate your comment! Fabulous idea! So simple and effective! Thanks Alison. It really is such a simple diy and offers a personal touch to labels and cards! This are adorable - I love that you can make a whole reindeer family! Me too, Emma! I like the personal 'signature!' Thanks for stopping by! Thank you, Lisa! So glad you like them. I appreciate your comment, thanks for stopping by! Glad you like them, Sharon! Thanks for your comment it's much appreciated! These are adorable! Thank you for linking up with #frugalfamilylinky your post is a featured post for next week! Thanks, Helen. We had fun making them! Very cute!! Thank you for sharing at Sharing Saturday!! And thank you for featuring them, Carrie! Really Cute!!! Thank you for linking up to On Display Thursday. Glad you like it, Carmody! My 7 y/o son would love to put these on envelopes for us - he might let his sisters help! Great idea. So easy and fun, Abi! I hope your son has fun with it!